Russian Foreign Ministry pokesperson Maria Zakharova attends a special news briefing in Moscow. RBTH presents a selection of views from leading Russian media on international events, featuring an interview with the official representative of the Ministry of Foreign Affairs, Maria Zakharova, as well as reports on plans by the UK to declare Russia a national security threat and a Kremlin proposal to support Russian tour operators hit by the ban on flights to Egypt. 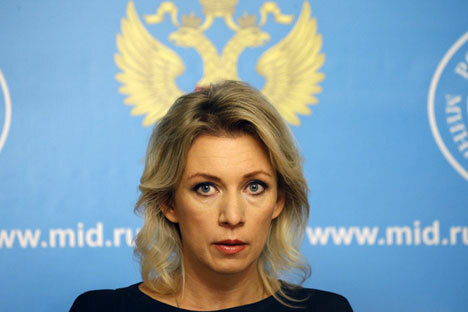 The Komsomolskaya Pravda tabloid daily has published an interview with the official representative of the Ministry of Foreign Affairs, Maria Zakharova. "We have a national vision of what we need to achieve," Zakharova said about the objectives of the Russian operation in Syria. "Firstly, to minimize terrorist danger, which is a threat to the national security of Russia, and threatens the statehood of Syria. Secondly, to start the process of political settlement in Syria. Through dialogue between the opposition and Damascus, along with involving all foreign players who influence the situation in one way or another. " On the subject of the fate of Syrian President Bashar al-Assad, Zakharova claimed that "we never said if he should stay or go." "Assad's fate should be decided by the Syrian people," she said. During the interview, Zakharova also raised the subject of Western aid to the "moderate opposition” in Syria. "There are probably some plans by the Pentagon and other agencies involved in training the so-called moderate opposition in the Middle East," she said. "It may look attractive on paper – to supply a certain number of weapons, equipment, money, to help to make it heard. But there are a billion light years between the concept that is written in U.S. security agencies and what happens 'on the ground' in the Middle East. "When the supply of arms to these 'good guys' begins, no one can guarantee that they will not be resold to cannibalistic thugs tomorrow. There is even confidence that that's the way it will happen,” she said. The United Kingdom is prepared to name Russia a major national security threat, the website Svobodnaya Pressa reports, citing the British media. As such, Russia will be represented in the United Kingdom's next National Security Strategy, to be released by Prime Minister David Cameron on Nov. 23. In 2010, Russia did not make the list of major threats. This time, the authorities took the decision allegedly in connection with "rising aggression from Russia," in particular in Ukraine and Syria. "In fact, it is not news that Russia is now listed as a major threat in the UK's national security strategy," said Yelena Ponomaryova, a political scientist and a professor at the Moscow State Institute of International Relations. "I recall that the U.S. national security strategy, which was adopted in February of this year, lists Russia as threat #1. This means that the British simply repeat these passages after Washington, and are sort of setting a common foreign policy line. "No matter what Western politicians say, we have our own idea about the world, about the values of this world, about our present and future. And we need to adhere strictly to our strategic objectives. Our national security strategy. Our military doctrine. And to work for building up the defense and strengthening of the economy of our own country. There is no other way," said Ponomaryova. The Russian government has begun to discuss a package of measures to support tour operators after the ban on direct flights to Egypt, reports the business daily Kommersant. The issue was raised at a meeting of Prime Minister Dmitry Medvedev with his deputies, as well as at a meeting held by Deputy Prime Minister Arkady Dvorkovich. "We should not indulge in illusions, this will not be a short period of time, and it is likely to take time to provide security for tourism in Egypt, in addition to the return of our citizens," said Medvedev. One of the proposals, said a newspaper source close to the government, is to reserve up to $15.5 million in the 2015 budget to compensate for the costs of the return of tourists and their luggage from Egypt, as well as for the support of tour operators. It is expected that this amendment will be made to the bill on changes to the budget that the State Duma will consider in a second reading on Nov. 13. But market players estimate only their losses to be at least 12 times higher. According to the estimates of the Association of Tour Operators of Russia (ATOR), if the embargo lasts longer than two or three months, the tourist industry will lose about $200 million. The newspaper's source in one of the specialized agencies explained that a mechanism for compensating tour operators for damages is currently under development.